Check out the latest Pets Black Friday 2017 Coupons on My Subscription Addiction! Last Day! 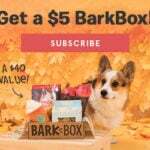 BarkBox Coupon – First Box for Only $5! RescueBox Cyber Monday Sale – 20% Off Subscriptions! Cat Lady Box Cyber Monday Deals! Pet Treater Cyber Monday Deal – Dog Box For $10 and Cat Pack For $5! Last Chance! BarkBox Black Friday Coupon – First Box for Only $5! RescueBox Black Friday Sale – $15 Off Your First Box!